The National Law Enforcement Officers Memorial Fund would like to extend a special thanks to the Milwaukee Brewers for hosting a Law Enforcement Appreciation Night when they took on the Pittsburgh Pirates at Miller Park on Friday, May 24. On this special night, the opening ceremony of the game was dedicated to Officer Jennifer Lynn Sebena, a Wauwatosa (WI) Police Officer who was killed in the line of duty last December. Officer Sebena’s friend and colleague, Officer Katie Gierach, threw out the first pitch on behalf of the Sebena family who was in attendance at the game. Also honored during Friday's game was Milwaukee’s own Harley-Davidson® Motor Company. 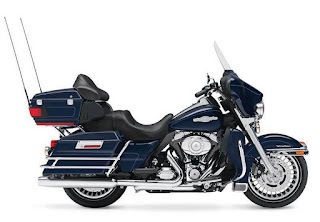 Harley-Davidson® is one of the Memorial Fund’s corporate partners and generously provides a new Peace Officer Special Edition Motorcycle each year for the Memorial Fund’s annual Harley raffle. As a result of the raffles, Harley-Davidson® has helped raise over $600,000 for the National Law Enforcement Museum. Memorial Fund Chairman and CEO Craig Floyd was on hand to present a token of appreciation to Sue Brand, Harley-Davidson-Police and Fleet Sales Team Member, on behalf of the Memorial Fund. A special thank you goes out to Law Enforcement Ambassador Nate Catura and the Federal Law Enforcement Officers Association for all of their help and support in organizing this event. FLEOA graciously hosted a pre-game reception for the game's honorees. The National Law Enforcement Officers Memorial Fund would like to take the time to thank the Weld County, Colorado Sheriff's Posse for their participation in this year's National Police Week. The Sheriff's Posse came all the way out to Washington, DC along with sixteen of their horses so that they could participate in both the 25th Annual Candlelight Vigil and National Peace Officers Memorial Day events. In addition to their participation in National Police Week events, the Weld County Sheriff's Posse met with Memorial Fund Chairman and CEO Craig Floyd to present an extremely generous donation of $13,000 dollars. This gift will be instrumental in assisting the Memorial Fund with their mission to memorialize fallen officers on the National Law Enforcement Memorial and to provide information that will help promote law enforcement safety. Congratulations to the Winner of this Year’s Harley Davidson! The National Law Enforcement Officer’s Memorial Fund would like to extend our congratulations to the winner of this year’s Harley Davidson raffle, Mr. Edwin H.! Edwin has been a law enforcement professional for more than 45 years in Nassau County, New York. He spent 34 years as a Nassau County Police Officer, and for the past 11 years has been employed by the Nassau County District Attorney’s Office, assigned to the DEA Task Force. Edwin has bought four Harley Raffle Tickets every year for the eight years that we have done the raffle. Edwin comes to Washington, D.C. for National Police Week every year to honor seven of his colleagues that are on our Memorial Wall. We greatly appreciate his support and send him our well wishes for his new ride! In 1962, President Kennedy proclaimed May 15th as National Peace Officers Memorial Day and the calendar week in which May 15th falls, as National Police Week determining the dates for National Police Week 2013 — Sunday, May 12th through Saturday, May 18th. At the conclusion of the 32nd Annual National Peace Officers’ Memorial Service at the U.S. Capitol, leaders of the Fraternal Order of Police, the FOP Auxiliary, Concerns of Police Survivors and the Memorial Fund brought the wreath from the Capitol to the Memorial to remain under the watch of honor guards from all over the country for the rest of the evening. For the fifth year in a row, the company’s flagship newspaper, USA Today, has donated a quarter-page ad paying tribute to officers killed in the line of duty. The ad, which appeared on page 5B of the May 14th edition, lists the names of all 120 officers who died in law enforcement service during 2012. And it reminds the family members, loved ones and colleagues of the fallen that a grateful nation will always remember these brave men and women. The Emerald Society, an organization of American police officers or fire fighters of Irish heritage, held the 19th Annual Emerald Society & Pipeband March and Service today. The service remembered all law enforcement officers killed in the line of duty, in particular officers of Gaelic descent, and featured numerous musical tributes. The Memorial was proud to host this ceremony honoring the service and sacrifice of our fallen officers. For more information about National Police Week 2013, including a complete schedule of events, visit www.LawMemorial.org/PoliceWeek. The 17th Annual Law Enforcement Memorial Run made its way to the National Law Enforcement Officer's Memorial this afternoon. Each year runners make the journey from Philadelphia, Pennsylvania to Washington DC to honor fallen officers from Pennsylvania, New Jersey, Delaware and Maryland. The run began 17 years ago with just two participants. Over time, the Law Enforcement Memorial Run has evolved into a group of over eighty participants including officers, supporters and survivors. In addition to the main group, hundred of extra runners join in during various legs of the trip. The run made several stops along the way to honor those law enforcement officers who have made the ultimate sacrifice. Tonight, the nation paused to formally dedicate the names of 321 fallen law enforcement heroes, added to the National Law Enforcement Officers Memorial in 2012. Of the 321 names, 120 were officers killed in the line of duty during 2012 and 201 were names of officers previously undiscovered. Following the presentation of the colors by the United States Park Police, Sergeant Katina Murphy of the Arizona Department of Corrections performed the national anthem and Chaplain Reginald H. Wilborn led the invocation. Craig Floyd, Chairman and CEO of the National Law Enforcement Officers Memorial Fund welcomed thousands of law enforcement officers, survivors and supporters in attendance before introducing Secretary of Homeland Security Janet Napolitano who delivered special remarks. U.S. Attorney General, Eric H. Holder, Jr., delivered the keynote address. Sergeant Michael Devine, New York City (NY) Police Department; Officer Steve Butterbrodt, Port Authority of New York and New Jersey PBA; Sergeant Ron Fabiani, Stone Park (IL) Police Department; and Sergeant Austin Weinstock, Triton (IL) Police Department, all performed moving musical tributes during the ceremony. The national monument now contains the names of 19,981 fallen law enforcement officers—from all 50 states; the District of Columbia; U.S. territories; federal law enforcement, corrections, railroad and military police agencies—who have died in the performance of duty throughout U.S. history, dating back to the first known officer death in 1791. Shortly after 2 pm today, nearly 1,700 members of the Police Unity Tour completed their long journey to Washington, DC. Participants traveled hundreds of miles the past three days—from six spokes in East Hanover (NJ), Franklin Township (NJ), Millville (NJ), Portsmouth (VA), Richmond (VA), and Philadelphia (PA) to the National Law Enforcement Officers Memorial. After all riders had entered the Memorial, a brief ceremony was held, and Florham Park (NJ) Chief Patrick Montuore, founder of the Police Unity Tour, presented a check for $1.72 million to Craig W. Floyd, Chairman & CEO of the NLEOMF—the highest amount raised in the history of the Police Unity Tour. We thank all the members of the Police Unity Tour, who worked tirelessly to ensure the service and sacrifice of America's law enforcement heroes are forever remembered. Their generosity, commitment and unity are vital to honoring all 19,981 officers killed in the line of duty. This Mother’s Day law enforcement officers and motorcycle enthusiasts gathered at RFK Stadium in Washington, DC to prepare for the 18thAnnual LawRide to the National Law Enforcement Officers Memorial. Hundreds of motorcyclists cruised past the U.S. Capitol, down Pennsylvania Avenue, and up 6th Street on their way to the Memorial. For photos from the 2013 LawRide, as well as from other events happening during National Police Week, follow NLEOMF at www.facebook.com/nleomf, on instagram @nleomf and on twitter @nleomf. The Metropolitan Police Department (MPD) of Washington, DC, the Fraternal Order of Police DC Lodge #1, and the DC Chapter of Concerns of Police Survivors hosted the 34th Annual Washington Area Police Memorial Service at MPD’s Headquarters in downtown DC with Bruce Johnson, of WUSA-TV, as master of ceremonies. This annual service recognizes the work of all DC Metro area law enforcement officers. Special recognition was given to those who made the ultimate sacrifice in 2012, including Trooper Andrew Fox, Officer Chris Yung, Officer Adrian Morris, Officer Forrest Taylor, Officer William Talbert, and Sergeant Morton Marshall Ford III. Following the presentation of colors and the national anthem, introductory remarks were given by District of Columbia Police Chief Cathy L. Lanier, followed by remarks from District of Columbia Mayor Vincent C. Gray and guest speaker Ronald C. Machen, United States Attorney for the District of Columbia. Representatives from the Virginia State Police, Prince William County Police, Prince George's County Police, Baltimore City Police, Montgomery County Police and Alexandria Police spoke about their officers lost in the past year, which was followed by a solemn roll call of fallen heroes from the DC Metro area. The names of the six officers honored at the service today will be dedicated on the walls of the National Law Enforcement Officers Memorial at the 25th Annual Candlelight Vigil this Sunday, May 13th at 8:00 pm, along with 321 other officers who have made the ultimate sacrifice. It was a sunny 72 degree day as Police Unity Tour Chapter VII celebrated their 10th anniversary at their kick off ceremony this morning on the waterfront in Old Town Portsmouth, VA. "We Ride For Those Who Died" is the Police Unity Tour’s Motto and this year the riders included police officers, sheriff's deputies, state and federal agents and survivors. Over 200 riders from eight states (FL, GA, LA, AZ, OK, TX, TN and FL) and the United Kingdom, as well as 50 support personnel departed on their annual trek to National Police Week in Washington, D.C for the Portsmouth spoke of the Police Unity Tour. As bagpipes sounded, the cyclists, motor officers and support personnel joined together for a presentation of the colors and singing of the National Anthem. This was my fourth year speaking at the Portsmouth kick-off ceremony and it was a great honor to be a part of such a remarkable event. For the next three days the riders will travel over 200 miles to end their journey at the National Law Enforcement Memorial. Please join us in Washington, D.C. on Sunday May 12th as Chapter VII, along with over 1,500 other riders and thousands of well-wishers, gather at the National Law Enforcement Officers Memorial for the arrival ceremony. The ceremony will begin at approximately 2pm. We wish the Police Unity Tour Riders safe travels on their journey. In spite of today’s rainy weather, public safety and law enforcement officers from the Washington, DC Metropolitan area gathered at St.Patrick’s Catholic Church to pray for a mass to honor those who serve in law enforcement and fire safety, and remember the fallen. The Mass included an honor guard, bagpipers, and the solemn playing of "Taps" in memory of those who gave their lives in the past year. According to the VALOR Program's May Monthly Bulletin, Federal Bureau of Investigation (FBI) statistics reveal that ambush situations made up the biggest category of circumstance in which 543 officers were feloniously killed between 2002 and 2011. This ambush tactic trend is one reason the VALOR program was created, providing free trainings to help ensure officer resilience and survivability in the event of violent encounters. Keep an eye out for registration for upcoming VALOR trainings in your area to help prepare you to respond to ambush tactics like those that have tragically taken the lives of so many law enforcement officers this year. Today, the Metropolitan Washington Council of Governments Corrections Chiefs Committee gathered at the National Law Enforcement Officers Memorial to honor correctional officers who have made the ultimate sacrifice—including nine correctional officers killed in 2012 and 21 fallen correctional officers from the DC metro area. Since the Memorial was first dedicated in October 1991, the Metropolitan Washington Council of Governments Corrections Chiefs Committee has conducted an annual ceremony at the Memorial to recognize the service and sacrifice of our nation's correctional officers. Led by Thomas N. Faust, Director of the District of Columbia Department of Corrections, this year’s ceremony included guest speakers Herbert Giobbi, Chief Operating Officer of the National Law Enforcement Officers Memorial Fund, Chief Kenneth Ellerbee of the District of Columbia Fire and Emergency Medical Services and Paul A. Quander Jr., Deputy Mayor of the District of Columbia. Following the presentation of the colors by the honor guard, Sergeant Chris Sawyer of the Loudoun County Sheriff's Office performed the national anthem. The invocation was led by Chaplain Rosco Lockheart of the Montgomery County Department of Corrections and Rehabilitation. After a brief welcome by Chuck Bean, Executive Director of the Metropolitan Washington Council of Governments, there was a special recognition of Chief Kenneth Ellerbee. The roll call of fallen heroes was then solemnly read aloud as members of the participating honor guards carried red roses to the center medallion of the Memorial. After each flower was placed, a single bell tolled. In a traditional symbolic gesture, white doves were released at the end of the ceremony and a wreath was placed at the medallion. In 1996, Congress officially changed the name of the week to National Correctional Officers and Employees Week. The names of 585 correctional officers are engraved on the National Law Enforcement Officers Memorial. These courageous heroes are forever remembered. Their light continues to shine through their memory and through the selfless men and women who continue to serve each day. 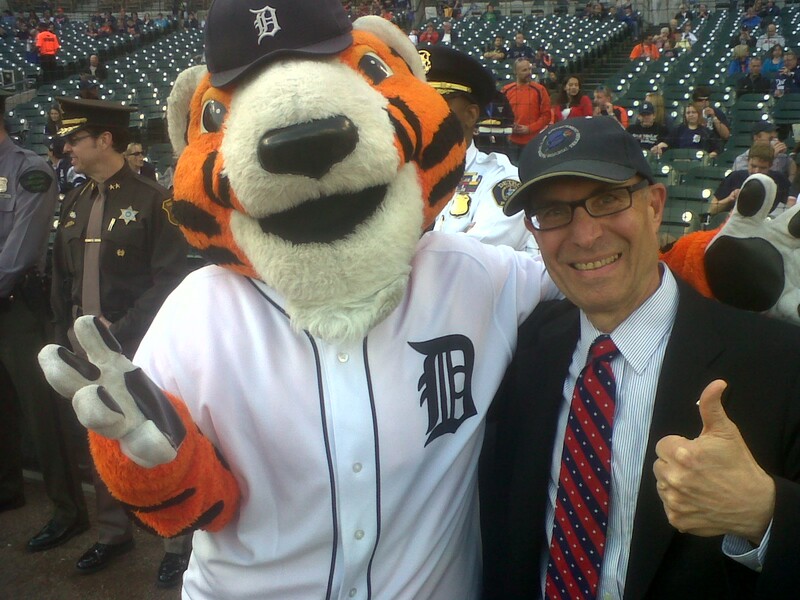 What a great Law Enforcement Appreciation Night last evening at Comerica Park, not to mention a great 6-1 win for the Detroit Tigers against the Minnesota Twins. More than 900 law enforcement personnel, family, and friends— from Michigan, Ohio, Indiana, and Southern Ontario, Canada—came out to support law enforcement and the Memorial Fund, along with some 30,000 fans and supporters. Representing the Memorial Fund were Chief Operating Officer Herb Giobbi and Law Enforcement Ambassador Brent Clark. 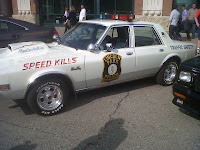 A great display of 25 Michigan police cars from past to present was on hand for attendees to check out as they made their way into the park. 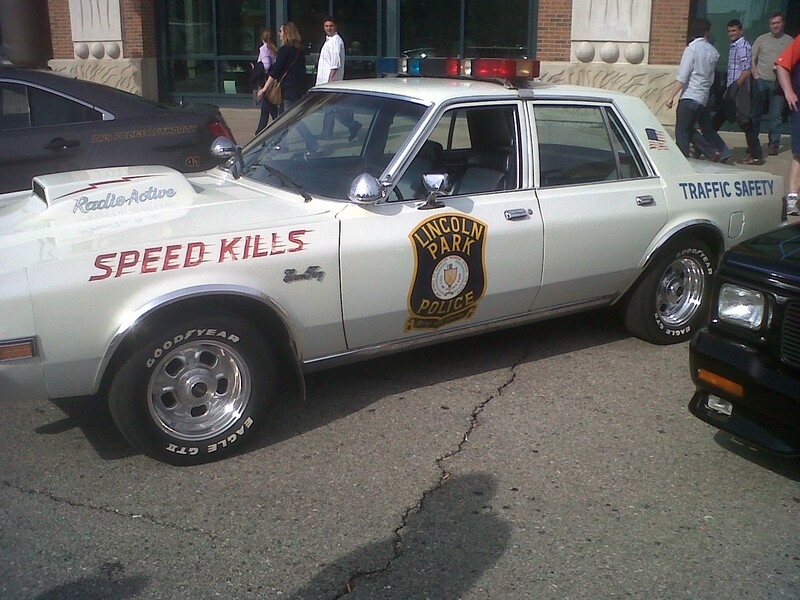 The police cars gave fans of all ages a look at how law enforcement vehicles have evolved over the years. Just before the game, the Tigers took a moment to honor Officer Patrick O’Rourke of the West Bloomfield (MI) Police Department. Officer O’Rourke was killed last September while responding to a domestic dispute call. We were happy to have Officer O’Rourke’s wife, kids, and parents attend the event in his honor. 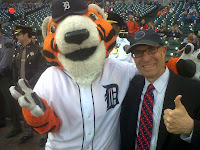 Overall it was a great night for baseball, the Memorial Fund, and Tigers fans. Thanks to our Law Enforcement Ambassador for getting out the word to sell 950 tickets in support of the National Law Enforcement Memorial. 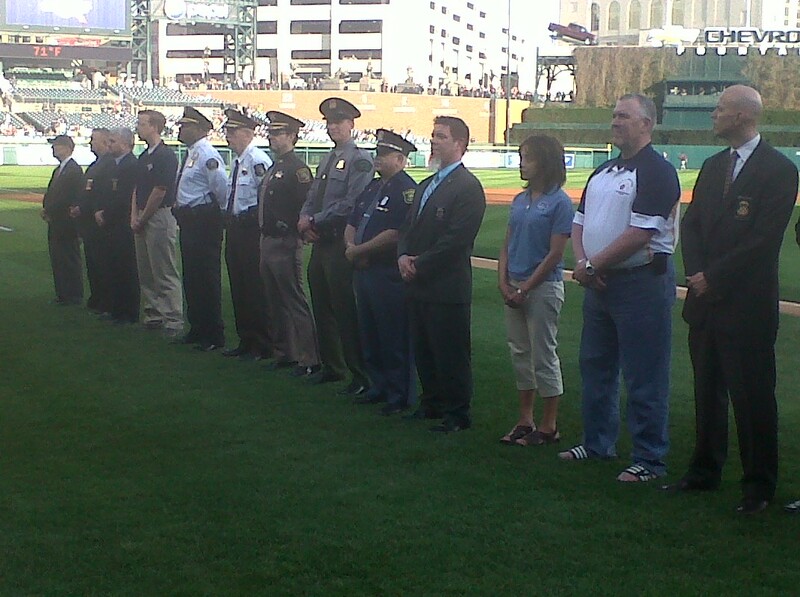 Also, a very special thank you to the Detroit Tigers for helping us to respect, honor, and remember those in law enforcement.